For the last two days, copper-coloured skies, a weak reddish sun, and the smell of burning hanging over everything from the bushfires both north and south. Beautiful, in its own way. 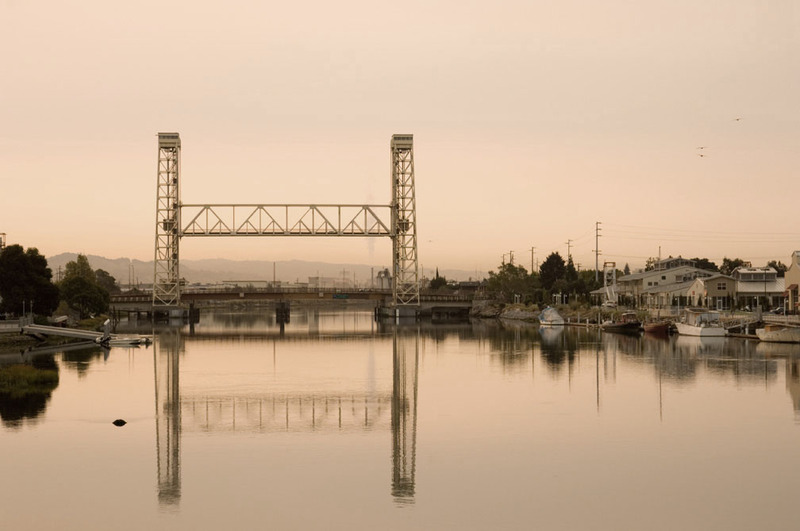 (Yesterday, early morning, Fruitvale Bridge from Park Street Bridge, Oakland Estuary). Oh I am so glad you took advantage of that light, I was going to call and tell you to get out there! Great picture, natural sepia. I wish I could nail this in poster-form. Hey, I put a lot of your stuff up around my room. I bet people think I'm really narcissistic. Or obsessed with robots. (it's all good, it just took time to do. Obsessions and all that, you know). And doesn't that just add to the allure? :-).